The production of jade belt plaques began in the Tang Dynasty, and jade belt system was followed in Five Dynasties, Song, Liao, Jin, and Ming periods. The production of jade belt plaques began in the Tang Dynasty, and jade belt system was followed in Five Dynasties, Song, Liao, Jin, and Ming periods. A jade belt consists of Kua and thallium tail (ornaments with head pieces) collectively called as a belt plaque. Early Ming Dynasty was the heyday of jade belt plaques, and began to decline in the late Ming Dynasty. Jade belt plaque was an integral part of the official dress, and different Kua numbers and decorations marked the wearer's different status. Only emperors, empresses, concubines, crown princes, imperial princes, commander princes, dukes, nobles, prince consorts, imperial uncles, civil and military officials of the first grade were qualified to use jade belt plaques in Ming Dynasty. The number of jade belt plaques in early Ming Dynasty was uncertain. According the present survey, since Yong Le of Ming Dynasty the number of jade belts was all 20, including 18 Kuas and 2 thallium tails. Before the middle of Ming Dynasty, the decoration of jade belt Kua was very rich, mostly with engravings. 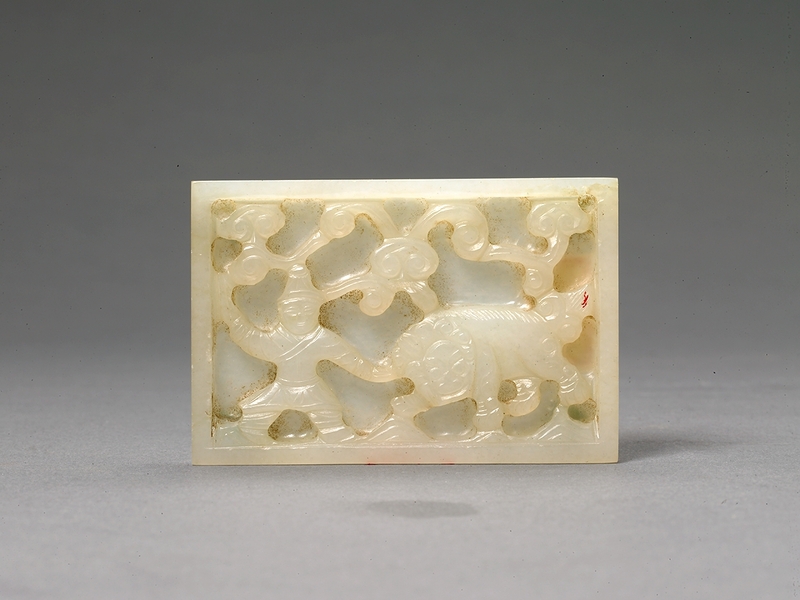 But after the middle of Ming Dynasty, most jade belt plaques were with plain surfaces. This set of belt plaques was made of sapphire, whose color is plain with flawless uniform. Its designing idea is creative, with bright colours and neat engravings. The whole set consists 20 belt plaques, among which 2 rectangular thallium tails, 6 peach shaped ones, 4 small rectangles, 8 slightly different sizes of rectangles, but all are with sunken ground deep carvings and also with frames. 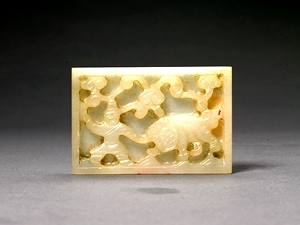 Among them, 10 have patterns of figures playing with lions in relief, 6 peach shaped ones carved with human figures, 4 small rectangles carved in Ruyi-sceptre cloud design. 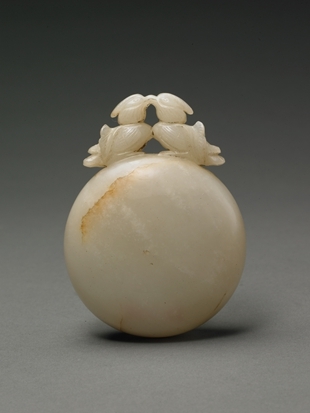 This round box was made of white jade, clean and delicate, and it has yellow erosive grains in some areas. 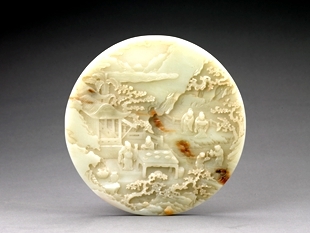 This round box was made of white jade, clean and delicate, and it has yellow erosive grains in some areas. On the box there is three-dimensional carving of a pair of mandarin ducks, with their mouths, chests connected. The crowns, eyes, and feathers were carved with uniform fine incised lines. This box has a cover. The mandarin ducks are connected into a whole subtly, and are respectively located in the box’s body and cover. They become two couples correspondingly when it is opened. It is still bright after being unearthed. Ruyi-sceptre is a Chinese traditional mascot, which consists of a handle and a headpiece. Ruyi-sceptre is a Chinese traditional mascot, which consists of a handle and a headpiece. 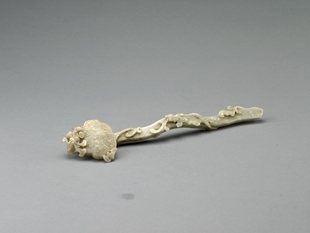 A headpiece of Ruyi-sceptre is often made in the shapes of the heart, the branch or the cloud as a plything., The sapphire Ruyi-sceptre in Qing Dynasty was the most favoured auspicious jade which was not only a treasure in the hands of nobles, but also a precious gift given by nobles to each other. This sapphire Ruyi-sceptre shines with green color mixed with yellow, with lock patterns. The whole piece was carved with the patterns of glossy ganoderma, fine jar, and bat,, indicating fortune, longevity and peace. It was still excellently bright after being unearthed. 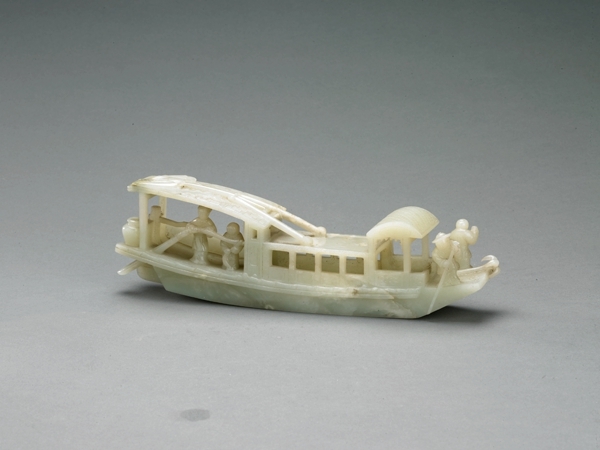 This boat was made of sapphire or green jade, hard and bright with little stripes. This boat was made of sapphire or green jade, hard and bright with little stripes. It is a three-dimensional reticulated work in the shape of a common Southern black sail boat, with bamboo-style outer leaf, and sail with tassels. A water storage tank stands on the poop, and an intaglioed character “#” can be seen on the sail which is closed at the top, and its anchor is closed at the bow. This tankard was made of greenish white jade, smooth and bright. This tankard was made of greenish white jade, smooth and bright. It was carved with the techniques of openwork and relief and it looks like a huge lotus leaf rolled into the body of the tankard, and it was decorated with lotus leaves, buds, lotus clusters. The bottom of the tankard was made into the twisting stems and the cover was made into a rolling down lotus leaf, and its cover was carved in the shape of an egret holding a lotus, connected by a simulated chain. 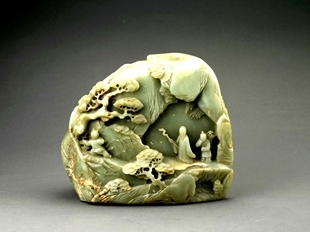 Most of the rock-shaped jade articles in Qing Dynasty were modeled in ancient paintings. 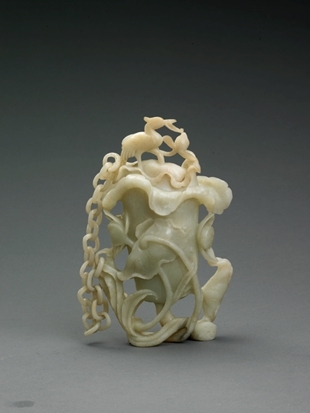 Combined with the art of painting, they promoted jade carving crafts to a new level. Most of the rock-shaped jade articles in Qing Dynasty were modeled in ancient paintings. 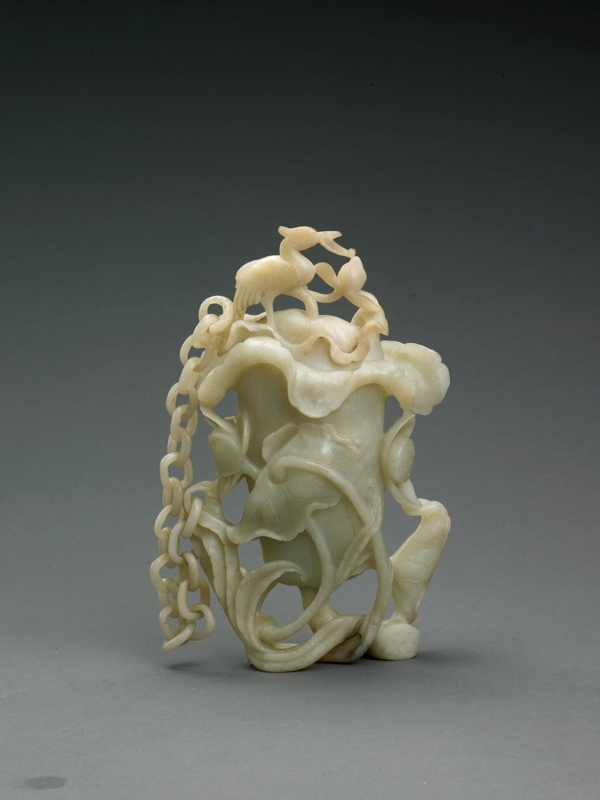 Combined with the art of painting, they promoted jade carving crafts to a new level. 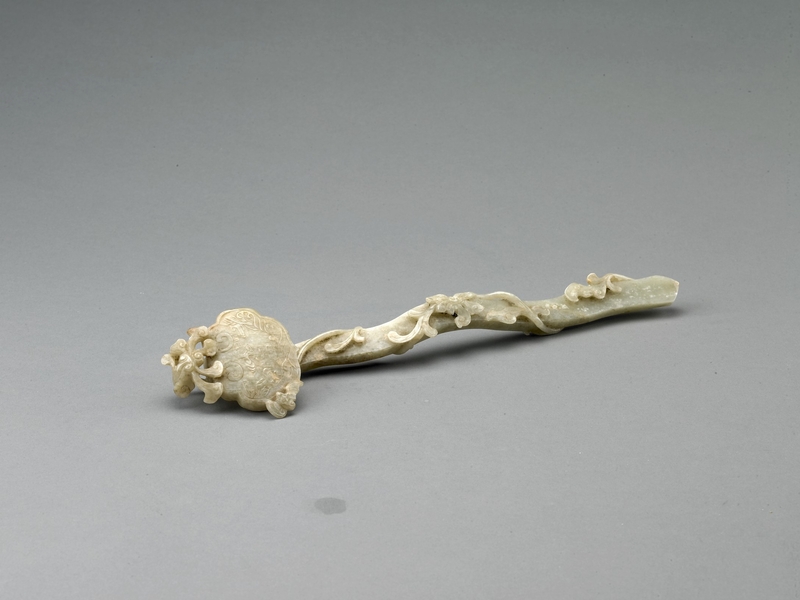 This article was made of green jade, with yellow leather tufts in between of bluish green. The whole set was carved from jade pebbles, using traditional Chinese paintings techniques of far mountains and near sceneries. The three figures, young and old, on the article are walking on the steep cliffs with different postures, and under their feet, there are bridges and streams with luxuriant woods by the sides of the mountains---a pleasant natural scenary. Jade table screens were more popular furnishings in Qing Dynasty, which were mainly carved in the methods of incised lines and relief, generally inserted in wooden seats. Jade table screens were more popular furnishings in Qing Dynasty, which were mainly carved in the methods of incised lines and relief, generally inserted in wooden seats. The patterns on both sides from the center of this table screen were carved by using multi-level relief techniques. Long gallery, plantain, cinnamon, table, bench, and figureswere carved on the one side, and on the other side, landscape,, willows, boat and figures can be found., using the method of far mountains and near sceneries, therefore, it has distinct levels and refined techniques, and excellent polishing. 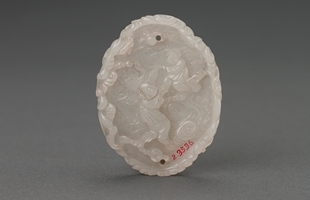 This pendant was made of white jade, which is meticulous, smooth and bright. Human figures were carved on the one side, surrounded by delicate lace-shaped fine frames; on the other side there was no frame but a poem. 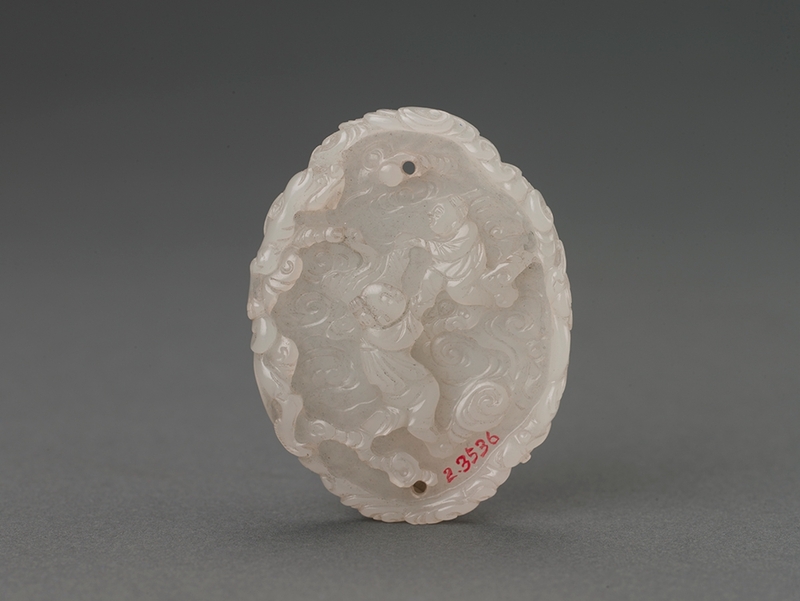 This pendant was made of white jade, which is meticulous, smooth and bright. Human figures were carved on the one side, surrounded by delicate lace-shaped fine frames; on the other side there was no frame but a poem. There is a small hole on the top of the pendant for tying.